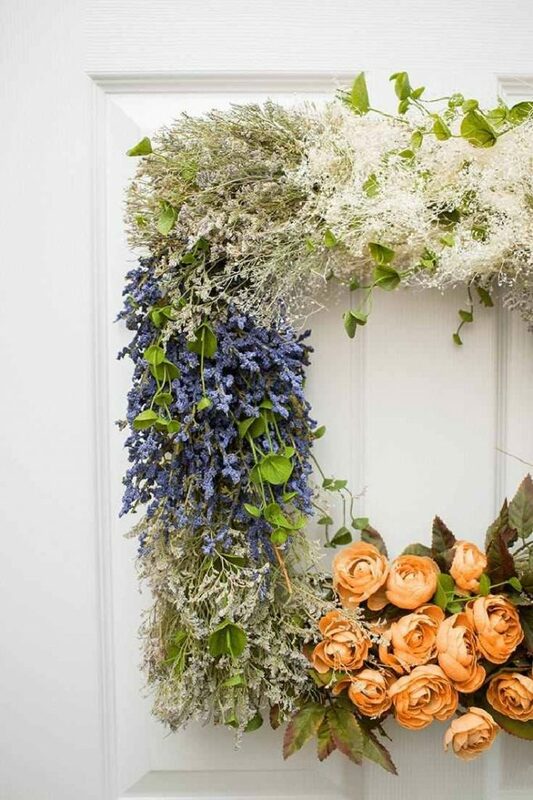 This beautiful, lush Vintage Flower Wreath is simple the perfect year-long wreath to adorn your door or a special place in your home. Use a combination of colors, floral textures and sizes to add volume and character. 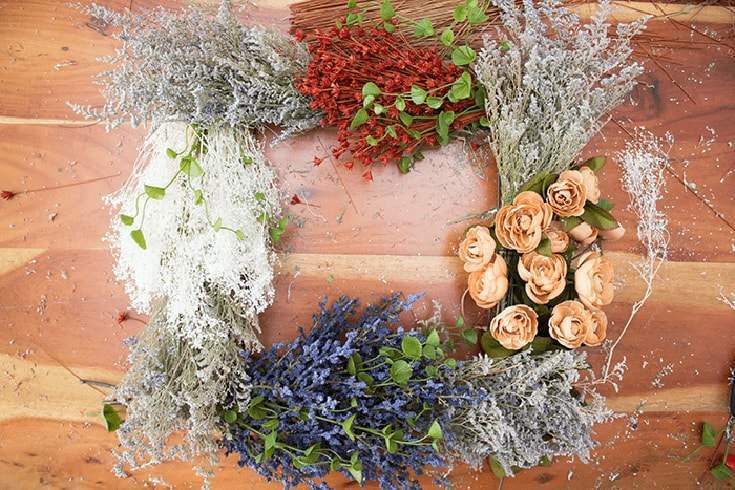 Using a mix of synthetic and dried flowers will give you that Vintage French feel, while keeping the wreath looking realistic and beautiful. 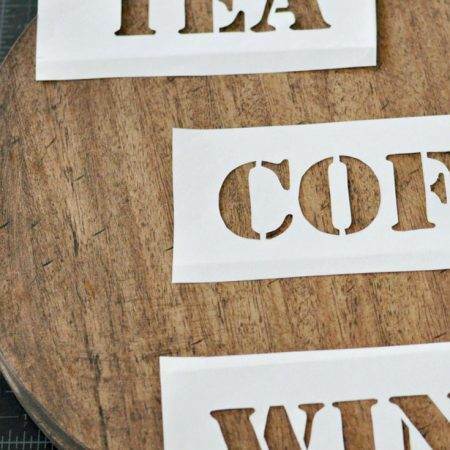 Read on to view the step by step tutorial and the supply list you will need. Hi Everyone! This is Jelica from A Pretty Fix, the blog about crafting and DIYing my way to creating my dream home. I’m back with all of you lovely readers of Pastels and Macarons, this time sharing this gorgeous Vintage Flower Wreath which mixes dried and synthetic florals in a fresh and Vintage Farmhouse sort way. incorporates gorgeous teal, gold, and white yarns (see my Introduction To Weaving to see how it turned out), I love adding modern elements in traditional decor. And today’s DIY is no different. 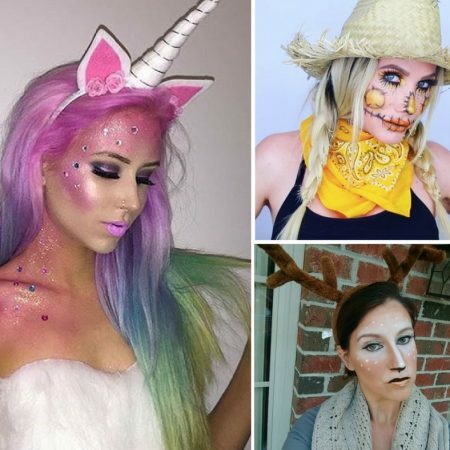 Here’s what you will need to recreate the look! Bundle together 4 of the same florals by wrapping floral wire at the base of each. Attach to the 4 corners of the frame. Gather floral bundles for each of the four remaining spaces available. To create variety, try using a different colour for each space. But to create cohesion, mix in greenery within each of the bundles and attach. 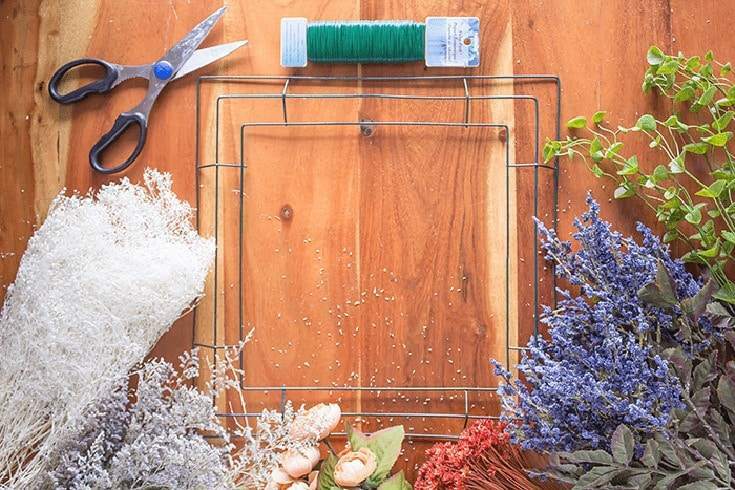 Continue adding smaller bundles to any bald spots to really fill out your vintage flower wreath. the edges until you are happy with your form. Step 4: Hang & Enjoy! Now simply hang your creation and enjoy! 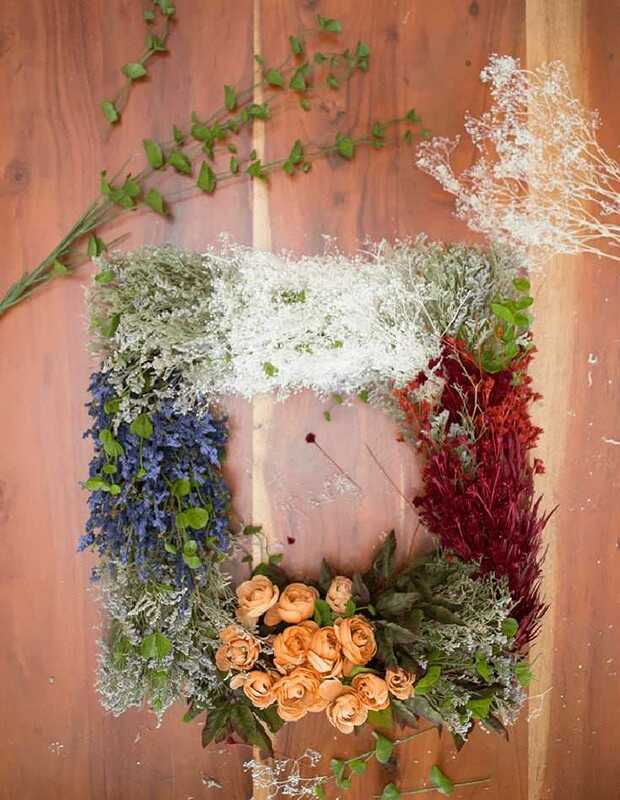 If you like this wreath craft, we would love you to Pin it to one of your boards! This is a beautiful piece to have in your home all year long or hang on your front door during the spring and summer months. I absolutely adore the look and am thrilled with just how versatile it is. 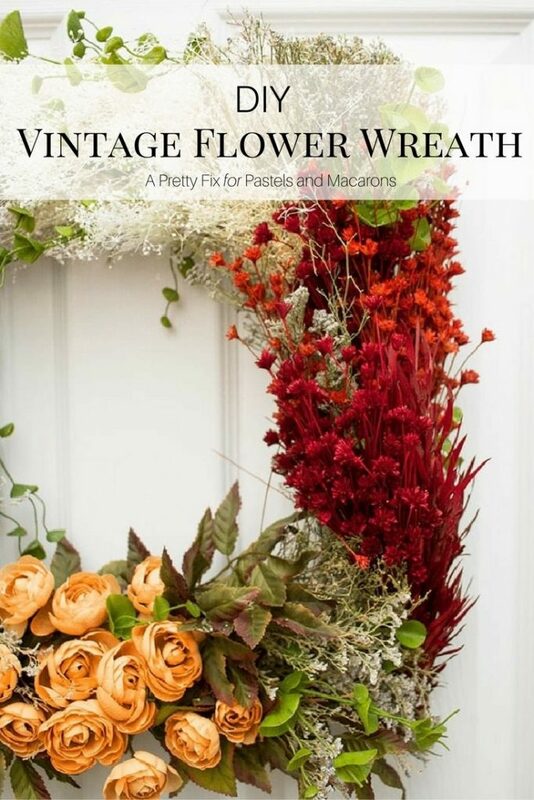 I hope you are inspired to try your own Vintage Flower Wreath craft! 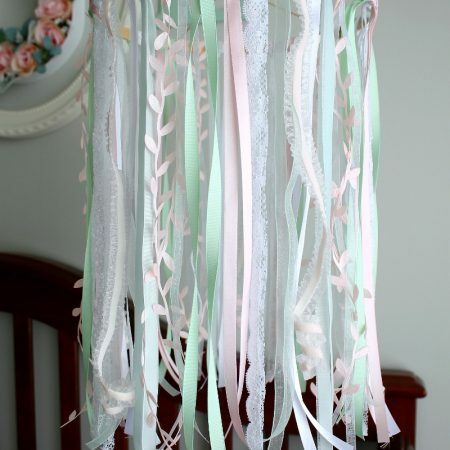 LEARN HOW TO MAKE THIS DIY SCANDI INSPIRED BLOSSOM BRANCH FOR YOUR FRONT PORCH! 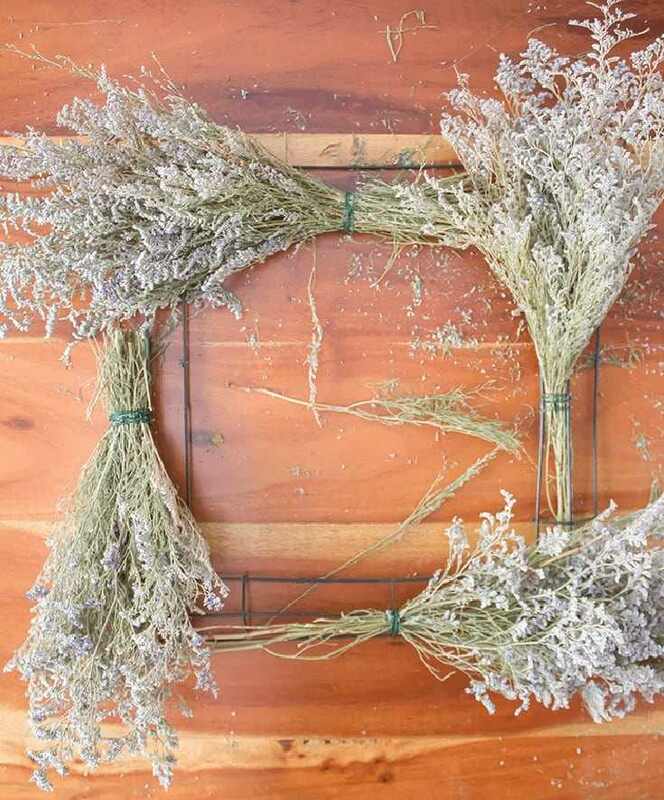 THIS DIY FAUX WILDFLOWER WREATH IS PERFECT FOR THE FALL AND SPRING! ANOTHER GREAT CREATION BY A PRETTY FIX! LOVE COASTAL DECOR? THEN THIS DIY NAUTICAL WALL HANGING IS PERFECT FOR YOU. 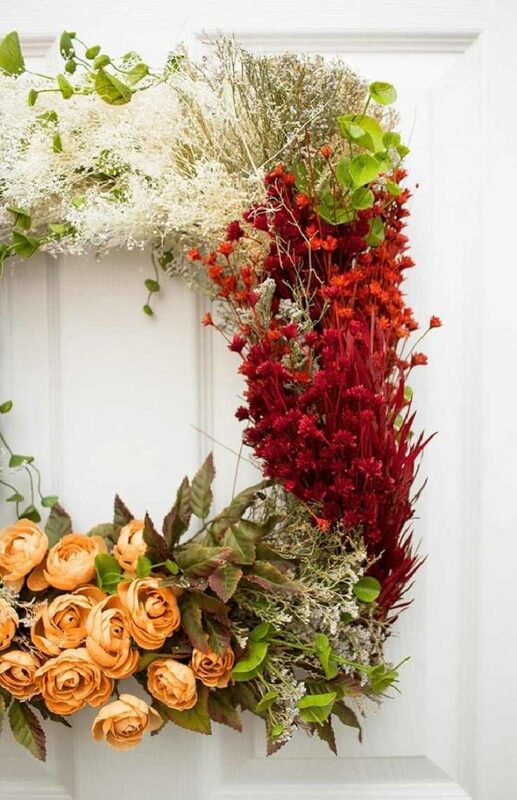 AND IF WREATHS IS WHAT YOU’RE ALL ABOUT, HOW ABOUT THESE BEAUTIFUL CHRISTMAS WREATHS. ONE OF OUR FAVORITES IS THIS FAUX CHRISTMAS BOXWOOD WREATH THAT LIGHTS UP!! 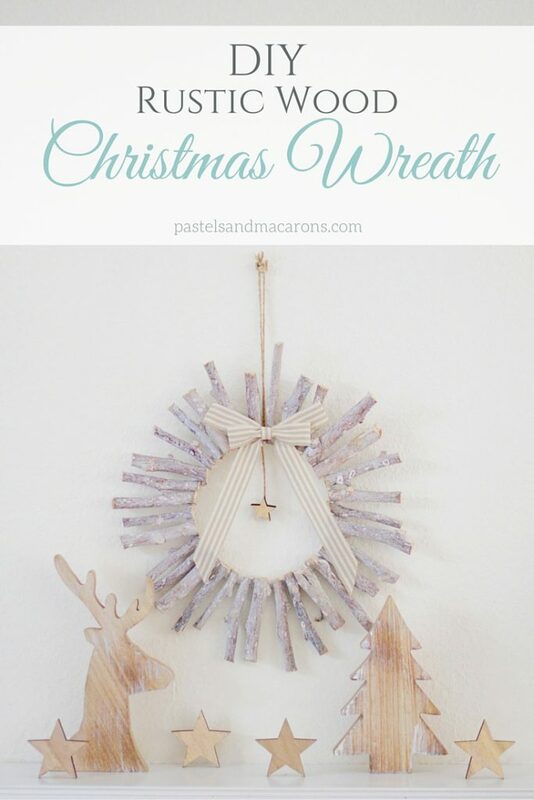 WE ALSO ADORE THIS DIY RUSTIC WOOD CHRISTMAS WREATH MADE FROM BLEACHED WOOD STICKS! This is so beautiful! You always make the most gorgeous wreaths! Isn’t it fabulous Susan! And yes, I absolutely adore Jelica’s pinecone wreath also! So beautiful. Gahhh!! Soooo beautiful!!!! 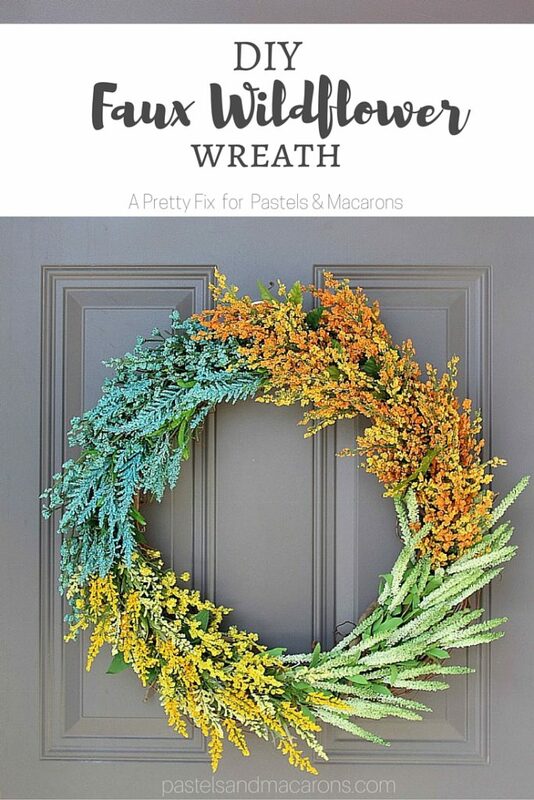 I think its time for me to tackle a new wreath.. lol Thanks for the inspiration! Thank you Leanna! Glad you like it. Normally I go for a traditional round wreath but I am really loving this square shape, it is so beautifully balanced with the colour & texture. Beautiful! Oh that it so beautiful! I absolutely love it! This is so pretty! love all the florals you used. Thank you Kristen. The florals Jelica chose are on point! 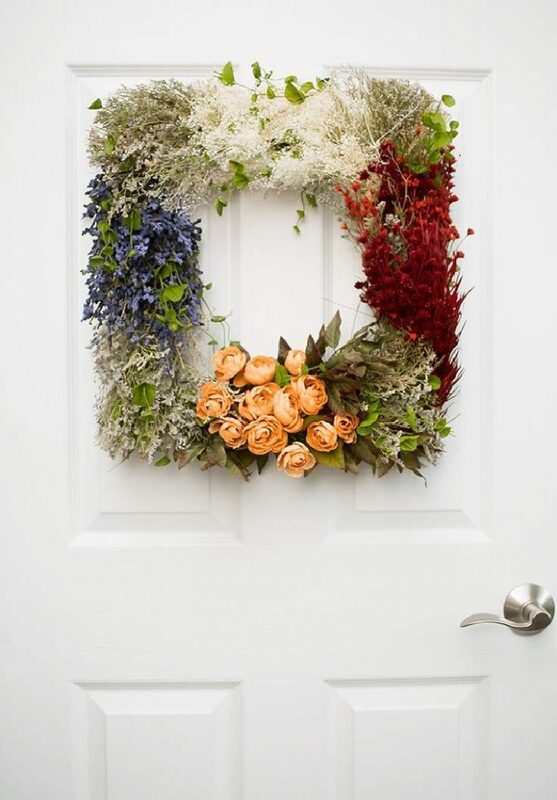 Such a beautiful idea for a wreath! 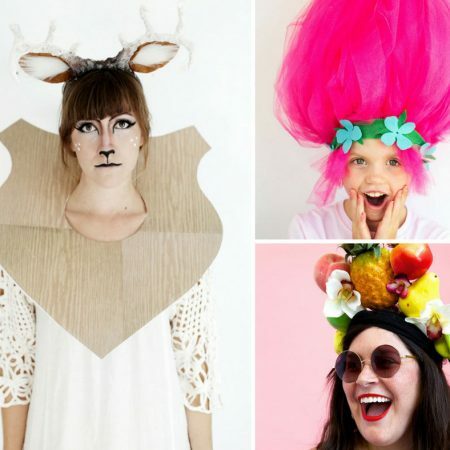 Obviously a wreath queen – look at all these creations! Hi Lindi, thanks you. Jelica is amazing. She always makes such beautiful wreaths! This came out really beautiful!! Thanks Roxanne, Jelica did an amazing job. Your wreaths are just beautiful! So talented. Glad I found your blog. Hey, Maria! 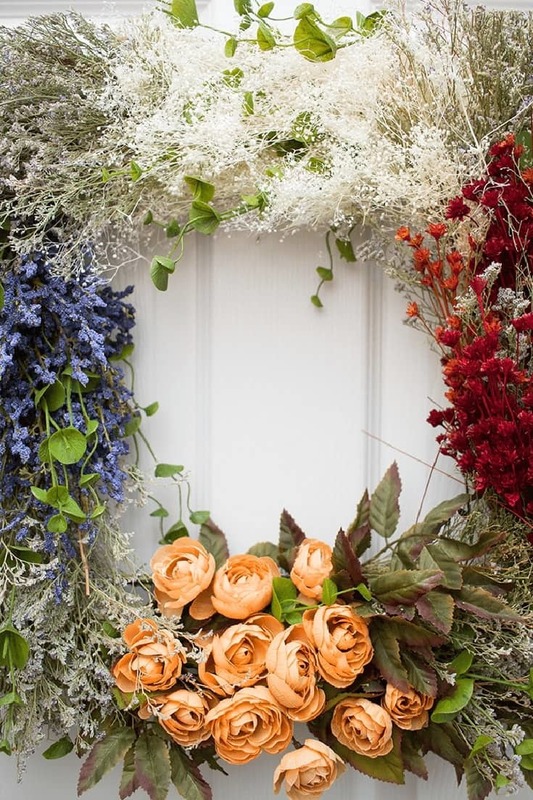 Just wanted to let you know that we loved your Vintage Flower Wreath so much when you shared it at the #HomeMattersParty last week, we’ve FEATURED it THIS WEEK! Hope you can check it out when you get a sec. Happy Friday!! !